Twenty-first century schools with state-of-the-art audio visual technology are giving Long Beach Unified School District students the edge they will need to compete in a global economy. With the newest Extron WallVault AV systems, students at Nelson Academy and McBride High School can easily see and hear teachers and each other in an interactive, collaborative classroom environment. Extron PoleVault technology will change the way we educate students and put a world of resources at their fingertips. Nelson Academy and McBride High School are among the first of several schools to be built with $1.2 billion in Measure K funds, available through a 2008 general obligation bond measure approved by voters. Measure K is being used to improve safety and accessibility, build new schools, and upgrade technology in the 81,000-student district. Long Beach Unified School District, with 84 schools, is located about 20 miles south of Los Angeles, CA and covers an area of approximately 45 miles, including five miles on the coast of the Pacific. Leaders at Long Beach USD realized that technology plays an important role in helping maintain their reputation as one of America’s finest school systems. Armed with a comprehensive technology plan and the funds with which to achieve their goals, Long Beach USD has embarked on an ambitious plan to bring 21st century learning to all of its classrooms. Starting at Nelson Academy, a grade 6-8 school that opened in the fall of 2012, Measure K bond funds made it possible for the 31 classrooms to be outfitted with the latest AV technology, including Extron WallVault systems for AV switching, control and amplification, in conjunction with a flat panel display. Flat panels were chosen because they do not have the support and maintenance costs that are typically associated with projectors, which require regular replacement of costly lamps and cleaning of air filters. Part of the administration’s curriculum plan was to increase voice intelligibility for instruction. 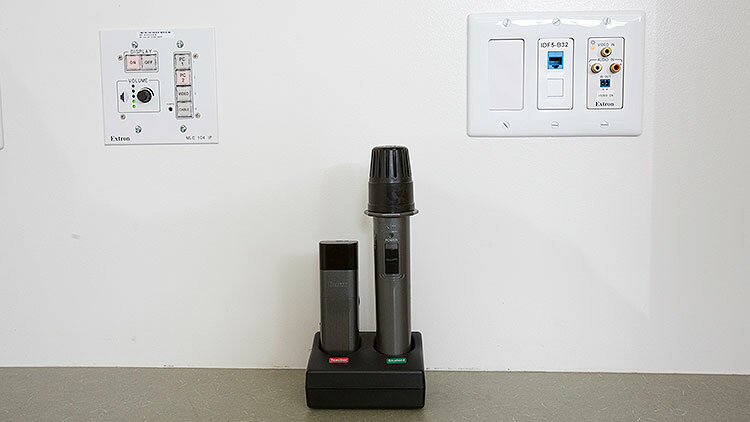 The Exton VoiceLift Microphone was selected to evenly distribute both the teacher and student voices throughout the classroom, and was a key component in achieving this goal. Teachers report that they can more easily project their voices over the classroom noise and that students are more engaged as they vie for use of the microphones. McBride High School is the first high school to be built in the Long Beach Unified School District in a generation, and includes an innovative curriculum. Known as career pathways, rigorous coursework is combined with instruction and training in three areas, engineering, health-medical, and criminal justice. The goal is ensure that graduates are college or career-ready in one of these high-demand fields. The career pathways program required progressive thinking when it came to classroom AV technology. 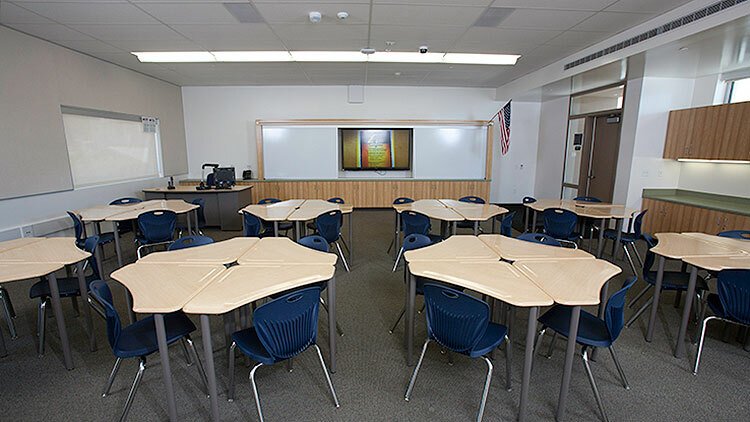 With a greater emphasis on collaboration and project-based learning, Long Beach USD selected the Extron PoleVault System to handle the audiovisual needs for its 43 classrooms at McBride. Each PoleVault System is a complete AV infrastructure, switching, control, and audio amplification solution that works with ceiling mounted projectors. It provides source inputs located throughout the room, providing students easy access to the system and the ability to share ideas with classmates. McBride High School welcomed its first class of 210 9th-grade students in the fall of 2013 and will eventually serve about 840 students. Another advantage of having Extron classroom systems throughout the district is that they can be connected to the network. This, combined with Extron GlobalViewer Enterprise software, allows support personnel to monitor and remotely control systems to make sure they are being utilized to their full potential. The global shut-down scheduling capability of the software ensures that all systems, displays, and projectors are turned off when not in use to reduce energy expenses and extend the life of components. In addition to new and updated facilities and classroom AV technology, Long Beach USD is also deploying wi-fi technology at every campus. This makes the district one of the first in the state to provide 1:1 access, enabling up to 40 wireless internet users simultaneously in each classroom. Extron classroom AV systems are built to support wi-fi and other new technologies, and are designed to help lower the cost of ownership in the long run. Teachers have reported reduced voice strain and increased student engagement with the VoiceLift Microphone.